Thought I’d post a few pics from my hike over the weekend with a friend: Mt. Mansfield. 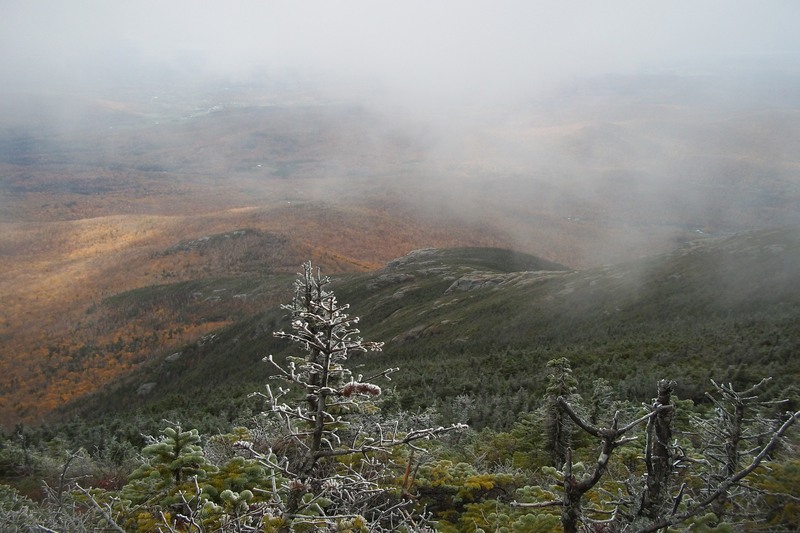 At 4,395 feet it’s the tallest mountain in Vermont, and the Sunset Ridge trail was a really beautiful route to the summit. Round trip journey: 6.4 miles. I am looking forward to visiting again when it’s not so foggy. 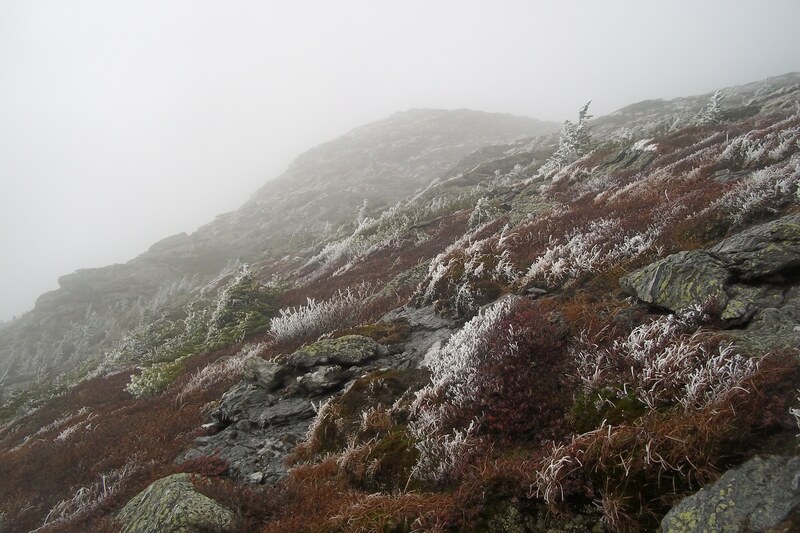 Despite the summit being in a cloud all day, the contrast of the frost and ice against the autumn backdrop was awesome! Ok, now that I’ve seen this, you realize I now have to hike this!!! If you ever want to go again, let me know…I’ll join you! oh, and by the way, your pictures are gorgeous!!! Funny, that’s exactly what I was thinking. 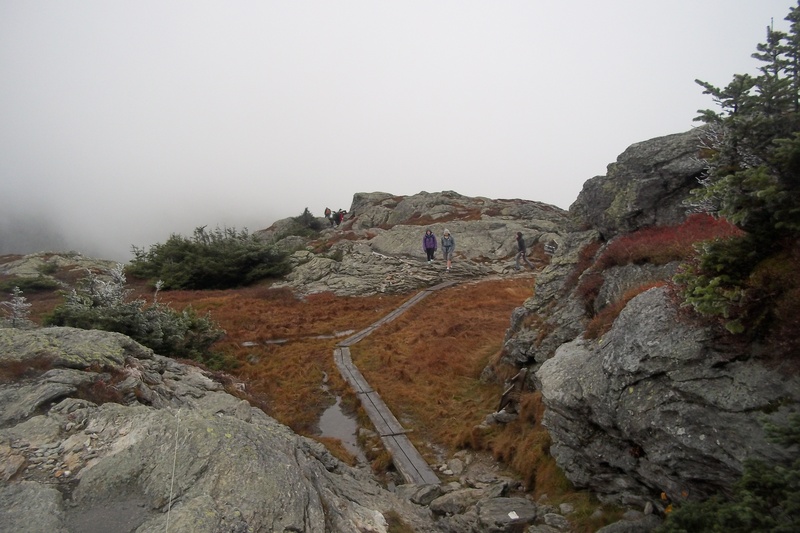 Road trip…Vermont…hiking…a 4300 footer…ya! Seriously, I viewed the pictures on Picasa, just haven’t gotten around to commenting yet. The trail looks beautiful. The views. The rocks. Even the fog added that certain something. I can only imagine what it’s like on a clear day. 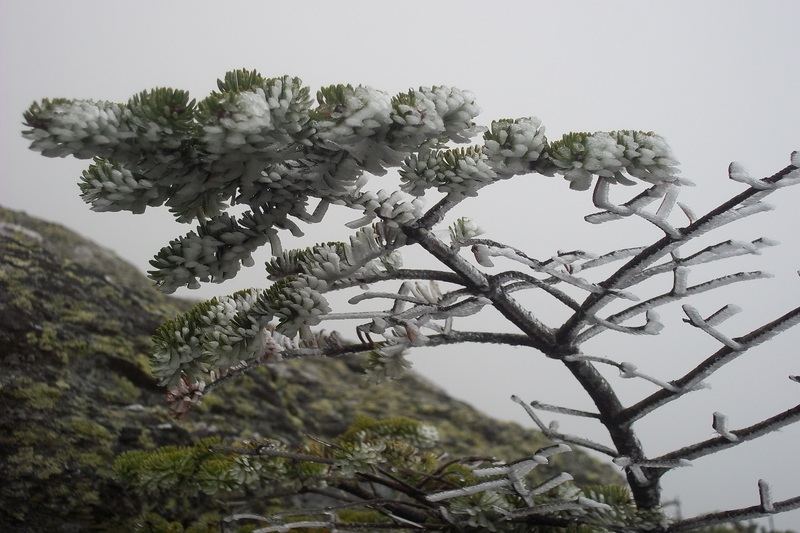 Did you encounter any ice on the trail? I can’t wait to use my new microspikes! may even need them this weekend! Gorgeous photos! Looks like an awesome hike! Thank you, Carol! It was really beautiful. Definitely looking forward to exploring more of Vermont! Nice pics as usual. I’m glad that you embraced the gray day which I’m longing for as all there is is sun here. 🙂 Looking at all that frost I, get the feeling that your hikes for this year are numbered. I hope that you can get a couple more in. 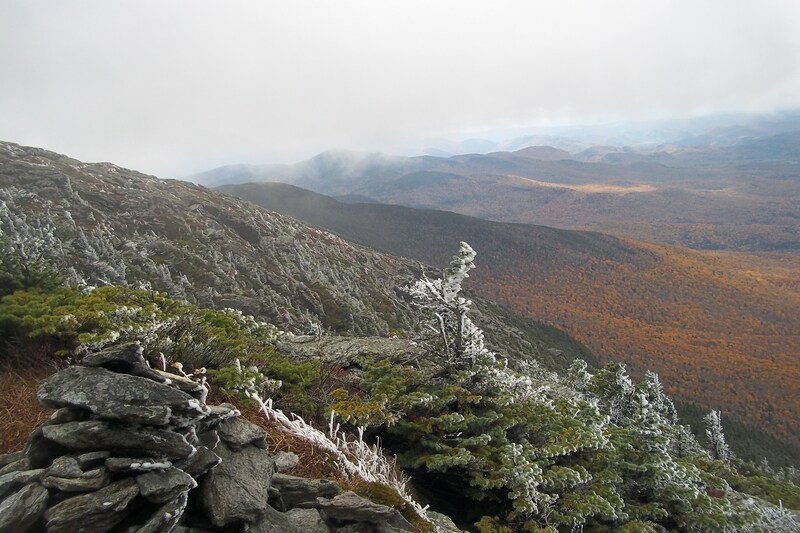 I hear there is snow already on the high peaks in the Adirondacks, so will have to check forecasts mid-week and make an informed decision about hiking this coming weekend. I will trade you some gray for some sun… I think I’ve forgotten what sun looks like at this point. but us diehard hikers will hike in virtually anything! 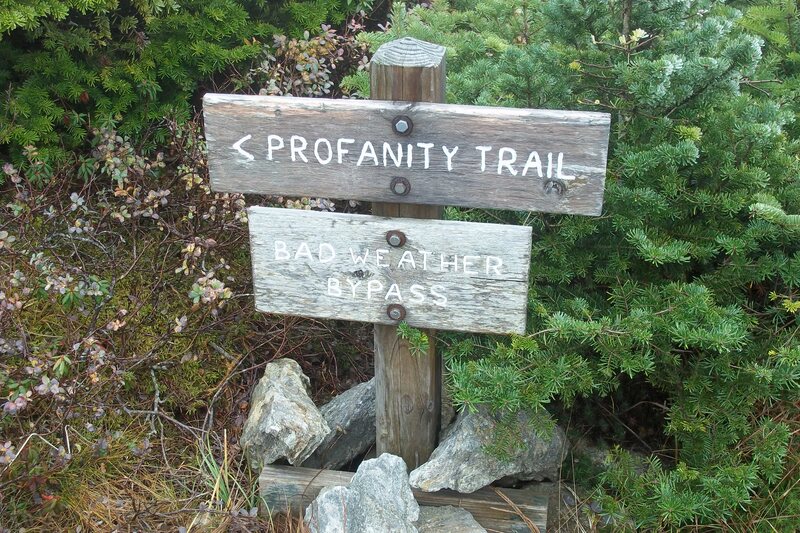 I guess I’m not a diehard hiker then! And I managed one of each this weekend Pru: Mt Abraham in the Greens (3rd highest) -we could have waved to each other had the weather been better but it was so bad on the summit I never considered you’d also be out on the trail! 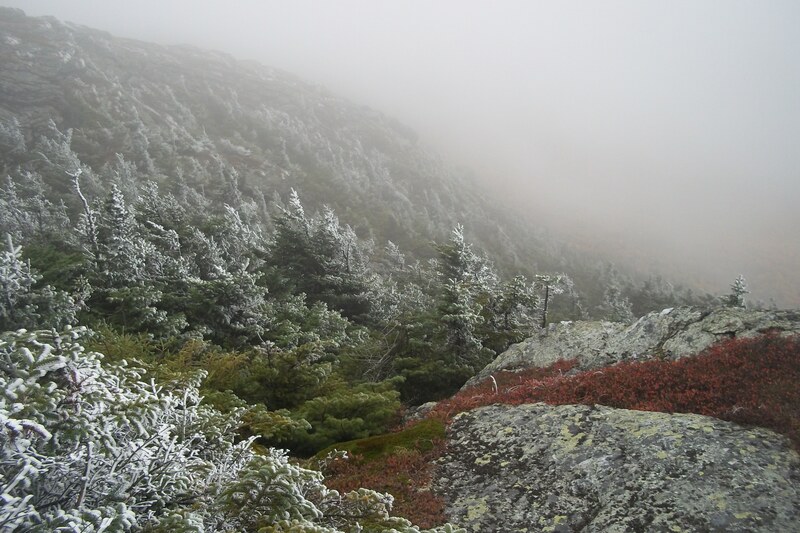 Yesterday we crossed over to the Daks and hiked Noonmark- 3500+ feet w/ first snow too. 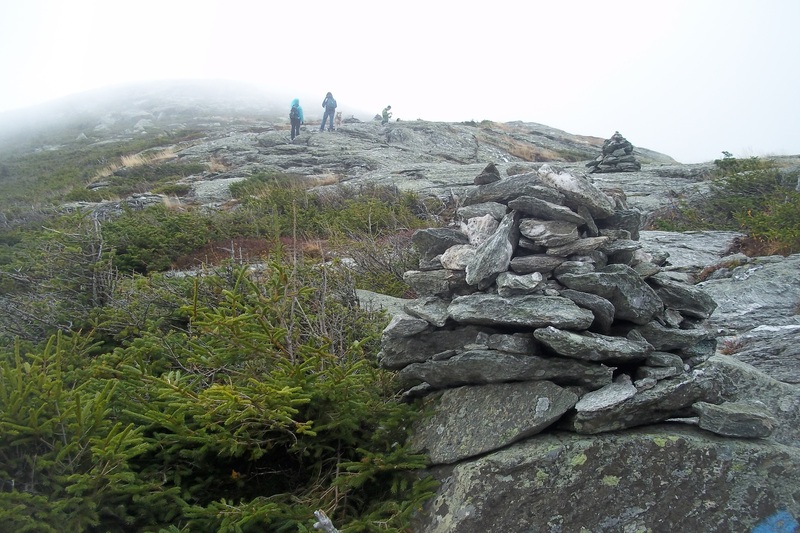 It’s quickly becoming my favorite ADK hike: <4 hours RT with truly spectacular views! Unlike Cascade there are no crowds – if only that were true of the AuSable Club parking lot! Karen, I completely forgot you mentioning you were coming to VT at some point. My friend and I could have revamped our plans to hike with you! Congrats on your conquests! I’m going to have to hike Noonmark one of these days. Would that be a fun one to do in winter, with snowshoes and crampons?? I’m the wrong person to ask about hiking in winter when I believe climbing the stairs in my house to bed is as much climbing as I’m up for then! Noonmark is a fabulous scramble with the last 1/4 to 1/2 mile as steep as anything I’ve done in the ‘Daks (or anywhere). But it’s only 2.5 miles & the views are awesome: the entire great range to Marcy, Dial etc., Dix and of course, as close as you’re going to get to Giant without actually climbing it. 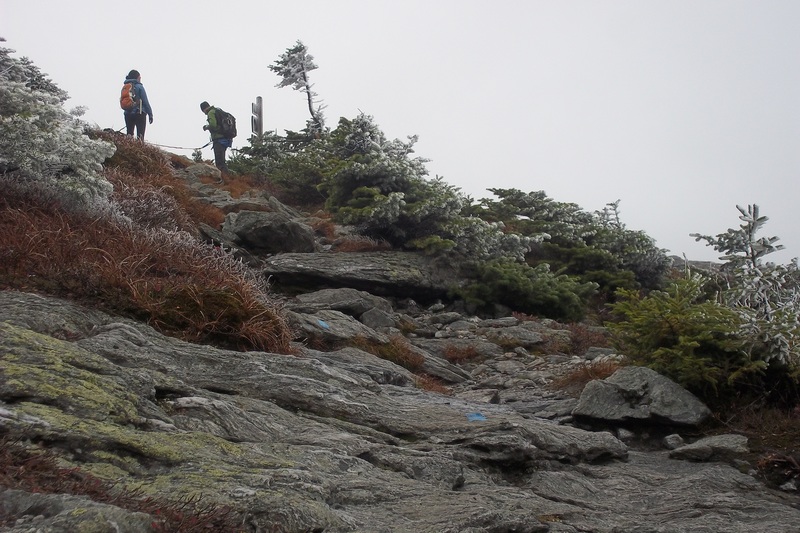 There is a 2nd, longer but much less steep trail starting on the Old Dix Trail that might suit a winter ascent better. 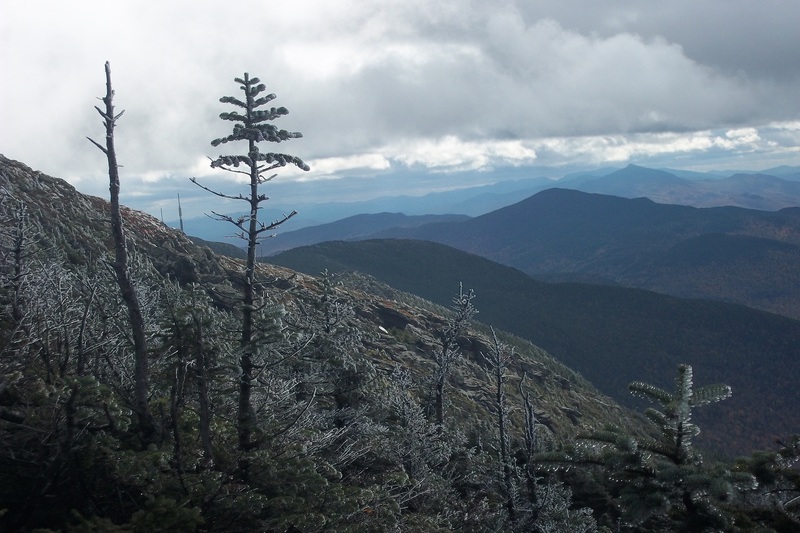 Noonmark’s become my favoring ADK hike but NOT in winter. I’ll do it again with you any other time as a loop trail. 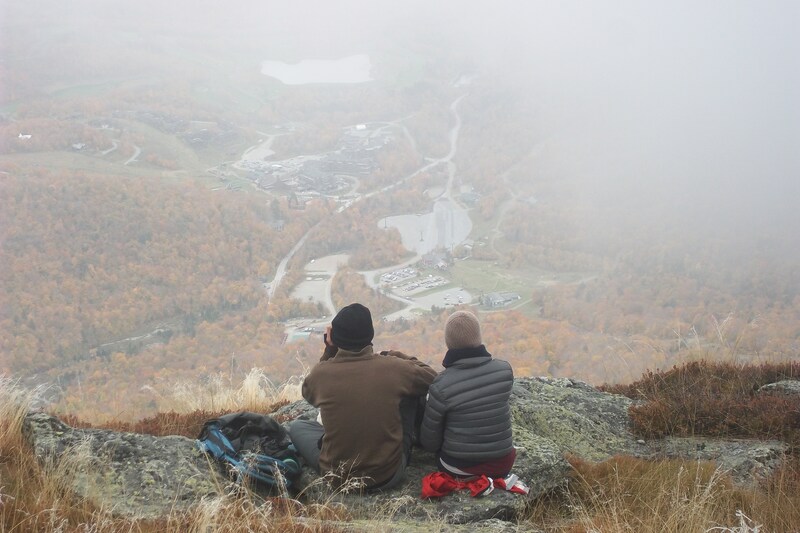 I would have called you on Saturday but the weather was so yucky that our plans weren’t firm until the last minute & I couldn’t have believed you’d be hiking as you hadn’t invested 5 hours to get to VT. You’re so hard-core, Pru, you put me to shame! Happy trails & looking forward to your nex hike/posting! Ha, thanks Karen! The weather wasn’t too bad on Mt. Mansfield – just foggy, and not nearly as cold as it looks in the pics. If it was raining I would have bailed. I’m not a fan of cold weather, and rain at this time of year is not fun for me to hike in. If you took any pics on your hike I’d love to see them! 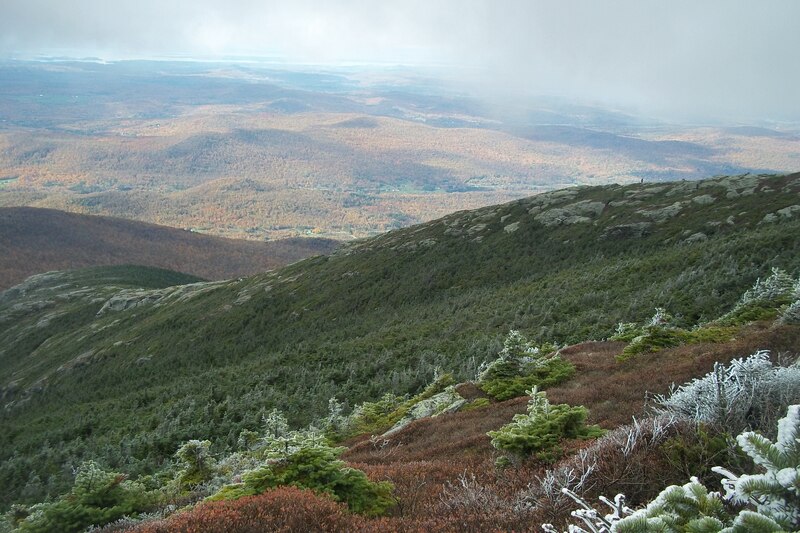 Will explore Noonmark, if not as potential winter hike, definitely as a nice warmup for the high peaks this spring. you are too a die hard one…you’ve hiked a high peak with snow and ice on the trail…that’s more than I’ve ever done! You might be catching up with me on that one in a matter of weeks! The pics are sooo nice! But I’m so sorry you’re not feeling well. Thanks! Feeling a little better tonight… just hope it goes away quickly. The weather sure doesn’t hold you back. The pics are awesome. The views are magnificent from the summit. So beautiful are the Adirondecks Mts.. Hope your feeling better. Lookin forward to your next adventure!!! and would that be Tabletop? the last weekend in October?? with your hiking pal, hikerchik46??? It would indeed! Can’t wait!! !